I spent a little bit of time with Greg Joswiak, Apple's Vice President of Hardware Product Marketing, talking about how the new AirPort Express works, especially the new AirTunes audio features. Essentially, AirTunes is a method of creating remote speakers for a copy of iTunes, and sending data to those remote speakers via a wireless network. That network can be formed by connecting an AirPort Express to another AirPort Express, to an AirPort Extreme Base Station, or even to a non-apple 802.11b or 802.11g access point. When you select an AirPort Express device in the new pop-up menu at the bottom of the iTunes 4.6 interface, that device essentially replaces your Mac's speakers as the audio-output source for whatever you do in iTunes. At that point you can do anything you'd normally do in iTunes -- play music from your Library, from someone else's library, or from your iPod; play an Internet radio stream; even play an audiobook. 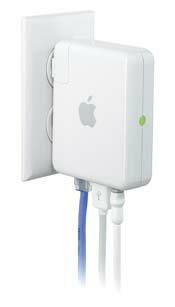 The sound won't come out of your Mac -- it'll come out of the speakers attached to the AirPort Express. For those wondering if AirPort Express supports MP3, AAC, or any other specific file formats, the answer is no. AirPort Express supports Apple's Lossless Compression technology -- and everything that your iTunes streams across the network to Airport Express is compressed using that technology. iTunes does the heavy lifting. When iTunes plays back standard audio content (AAC, MP3, audiobooks, music streams), it decompresses those file formats and creates what's essentially a raw, uncompressed audio stream. That stream is compressed on the fly using Apple's Lossless Compression, encrypted, and sent to the AirPort Express. AirPort Express decrypts the stream, decodes it, and outputs it in either analog format (if you plug in a standard analog mini jack) or as a digital PCM stream (if you plug in a mini-sized optical cable, which you can get from most major cable suppliers or straight from Apple for $39). If iTunes is playing back a digital multichannel file format like AC3 (Dolby Digital) or DTS, those bitstreams are wrapped in Apple's compression and encryption, and then decoded at the other end. In those cases, AirPort Express would end up streaming the raw AC3 or DTS stream via an optical cable to your home theater receiver for decoding. This means that if you're currently listening to music on speakers attached to your Mac, AirPort Express doesn't change the Mac side of the experience at all: you're still using iTunes as your musical interface, and you've got to keep that Mac on and iTunes open in order to keep the music playing. (As opposed to a device like Slim Devices ' Squeezebox, [ 4 mice, April 2004 ], which is operated by an infrared remote control and has its own display to show you what's playing and let you change what you're listening to.) You can also only play one thing at a time, and to only one set of speakers. But now those speakers can be just about anywhere. Apple's not ruling out taking those sorts of approaches -- Joswiak himself agreed that some sort of remote-control device would be a cool addition to AirPort Express. But as Joswiak put it to me, this is a first step for Apple in getting iTunes music into another part of your life -- in this case, into places where there are no computers or iPods.